Francesco Battista and his wife, Adele Filipponi, first appear in the Painesville, Ohio, area in the 1930 Federal census. They migrated to Painesville from Cleveland in 1922. 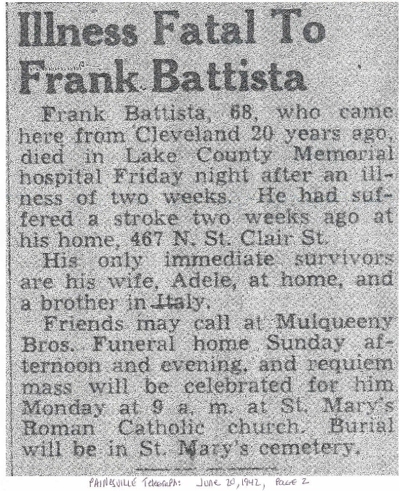 In America, Francesco was known as Frank Battista. Francesco Battista, son of Pasquale Battista and Georgian Piccagino, was born on February 20, 1873, at Casalciprano, Italy. He married Adele Filipponi about 1915 in Italy. 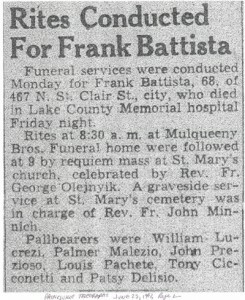 Francesco died on June 19, 1942, at home, 467 North St. Clair Street, Painesville, Lake County, Ohio, at age 69, of a cerebral hemorrhage. His body was interred at St. Mary Cemetery at Painesville Township, Lake County, Ohio. 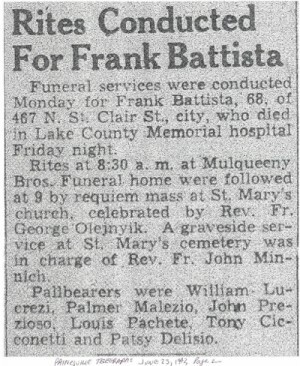 Francesco Battista immigrated to the United States in 1895. He was living in Cleveland, Ohio, when his wife, Adele Filipponi, immigrated to the United States in 1916. 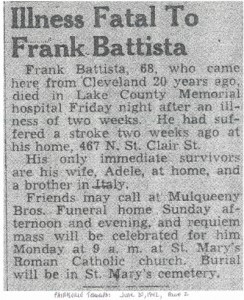 Francesco Battista established residence in Painesville, Ohio, in 1922. In Painesville, Francesco was a nursery laborer. There were no known children of Francesco Battista and Adele Filipponi.